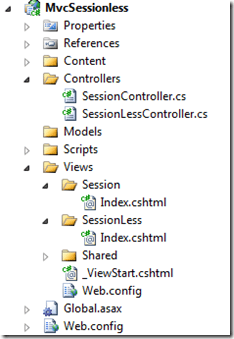 Code Inside Blog | HowTo: Sessionless Controller in MVC3 – what & and why? 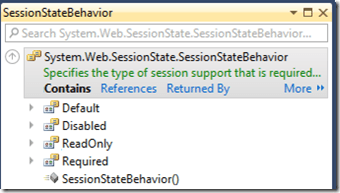 HowTo: Sessionless Controller in MVC3 – what & and why? At the moment I play with MVC3 RC. A new feature which is the introduction of a SessionState Behavior to, for example, make a controller state-, and sessionless. Unfortunately there wasn´t a really advertising. My demo application consists of two controllers. One of them is "sessionless". Also we have to views for the assignment. Beside the MVC App is an "Empty Website" (except the routing, which is usually leading to the SessionController). If you want to turn it off totally than choose "disable". Afterwards the session will be "zero". On the first few: You can´t access the Session. That means, for example, for recognizing the user you use the FormsAuth Cookie and so on. As soon if you try to write something into the "TempData" you are going to receive an Exception "The SessionStateTempDataProvider class requires session state to be enabled". If you try to move a file from controller A to controller B you need a cookie. But there is a CookieStateTempDataProvider used to be in the new MVC Futures. Is there a consequence for the performance? I´ve done some experiments with Visual Studio 2010 Test Tools and I tried to run a WebPerformances Test in the controller without the Thread.Sleep with 1000 iterations on sessionless and on the "normal" controller. Beware: I´ve never tested something with WebTest Tools from Visual Studio 2010 Test Tools. Because of this it´s possible that my results are wrong. The test runs on my Macbook in a VM. The WebApp is hosted in IIS7 - because of this the results aren´t significant for any performance stories of an IIS. On both sites there are some bolters but all in all we can see, that the Sessionless Controller is a bit faster. I´ve done another test ( a so called "LoadTest") with equal results. By the way: Really interesting tool, I´m sure it´s worth to take a look on it later on. But enough for now.